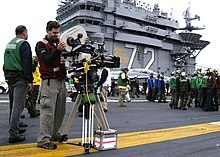 A camera crew sets up for scenes to be filmed on the flight deck for the motion picture Stealth with the crew of the Nimitz-class aircraft carrier USS Abraham Lincoln (CVN 72). A cinematographer or director of photography (sometimes shortened to DP or DOP) is the chief over the camera and light crews working on a film, television production or other live action piece and is responsible for making artistic and technical decisions related to the image. The study and practice of this field is referred to as cinematography. The cinematographer selects the camera, film stock, lenses, filters, etc., to realize the scene in accordance with the intentions of the director. Relations between the cinematographer and director vary; in some instances the director will allow the cinematographer complete independence; in others, the director allows little to none, even going so far as to specify exact camera placement and lens selection. Such a level of involvement is not common once the director and cinematographer have become comfortable with each other; the director will typically convey to the cinematographer what is wanted from a scene visually, and allow the cinematographer latitude in achieving that effect. Several American cinematographers have become directors, including Reed Morano, ASC who lensed Frozen River and Beyonce's Lemonade before winning an Emmy for directing The Handmaid's Tale. Barry Sonnenfeld, originally the Coen brothers' DP; Jan de Bont, cinematographer on films as Die Hard and Basic Instinct, directed Speed and Twister. Ellen Kuras, ASC photographed Eternal Sunshine of The Spotless Mind as well as a number of Spike Lee films such as Summer of Sam and He Got Game before directing episodes of Legion and Ozark. In 2014, Wally Pfister, cinematographer on Christopher Nolan's three Batman films, made his directorial debut with Transcendence; whilst British cinematographers Jack Cardiff and Freddie Francis regularly moved between the two positions. Cinematography was key during the silent movie era; with no sound apart from background music and no dialogue, the films depended on lighting, acting, and set. In 1919 Hollywood, the then-new motion picture capital of the world, one of the first (and still existing) trade societies was formed: the American Society of Cinematographers (ASC), which stood to recognize the cinematographer's contribution to the art and science of motion picture making. Similar trade associations have been established in other countries too. The ASC Vision Committee is known for working to encourage and support the advancement of underrepresented cinematographers, their crews and other filmmakers, and to inspire us all to enact positive changes through hiring talent that reflects society at large. "We call ourselves kinoks – as opposed to "cinematographers", a herd of junkmen doing rather well peddling their rags. We see no connection between true kinochestvo and the cunning and calculation of the profiteers. We consider the psychological Russo-German film-drama – weighed down with apparitions and childhood memories – an absurdity." ^ "We: Variant of a Manifesto" (PDF). monoskop.org. ^ Hora, John. "Anamorphic Cinematography". In Burum, Stephen H. (ed.). The American Cinematographer Manual (9 ed.). ISBN 978-0935578317.